What was the Grand Tour? 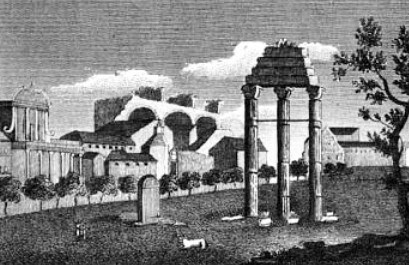 The Grand Tour was a period of foreign travel commonly undertaken by gentlemen to finish off their education. It was popular from the mid-17th century until the end of the 18th century when the outbreak of the Napoleonic Wars stopped most foreign travel. It saw a revival in the early 19th century after peace was restored in Europe. However, as travel became cheaper and easier, and in particular with the advent of the railways, visiting Europe ceased to be the province of the elite; the days of the Grand Tour were over. Who went on the Grand Tour? The Grand Tour was extremely exclusive and only undertaken by the very rich, mainly the sons of the aristocracy. This was because travel was both difficult and expensive. Travellers carried little money for fear of robbery. Instead, they took letters of credit from their London banks which they then presented in major cities. An added benefit of sending young gentleman abroad was that they were able to sow their wild oats with as little inconvenience to their families as possible. Typically, the young travellers experienced greater freedom on the continent, and became involved in drinking, gaming and romantic liaisons. How long did they go for? Originally, the Grand Tour was expected to last about three and a half years: six months of travelling and three years of living abroad, allowing gentlemen to absorb the cultures they were visiting and improve their language skills. The period of time spent abroad gradually shortened until most travelled for no more than two years. The most popular destination was France as French was the most commonly spoken second language. It was also the easiest place to get to. The fastest crossing was from Dover to Calais and the roads to Paris were very good. From Paris, travellers usually proceeded to the Alps and then by boat on the Mediterranean to Italy. They would usually visit Rome and Venice but their tour might also include Spain, Portugal, Germany, Eastern Europe, the Balkans and the Baltic. 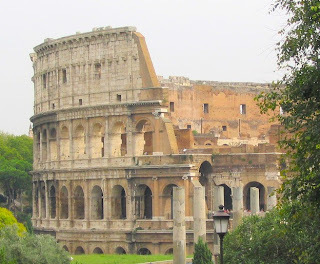 The chief destinations were the great cities of the Renaissance and the remains of classical civilisations, which usually included the excavations at Herculaneum and Pompeii. 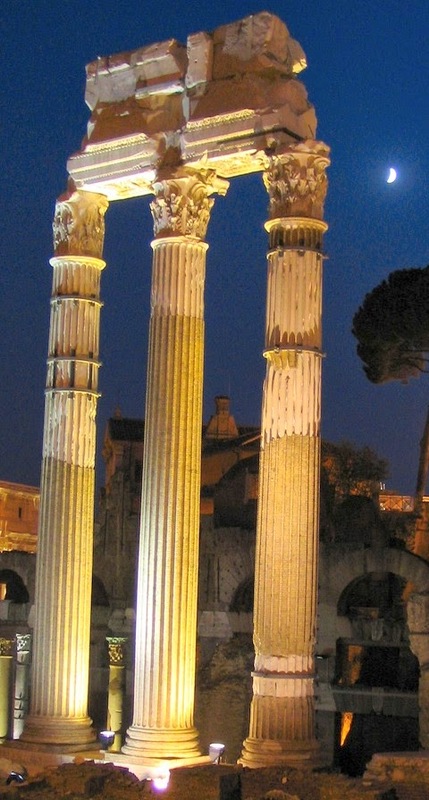 Classical statues were very popular, such as the Nile and the Tiber – statues representing river gods – which were discovered in Rome in the 16th century and formed part of the Pope’s collection. 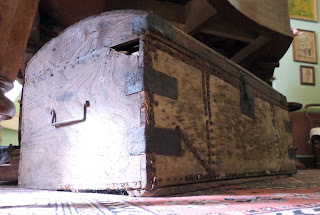 They were on display in the Museo Pio-Clementino from the 1770s. 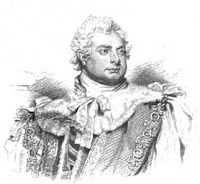 Those on the Grand Tour commonly visited the French and Italian royal families and the British envoys, such as Sir William Hamilton, who was the British ambassador to the court of Naples from 1764 to 1800. One of the aims of the Grand Tour was to give gentlemen an aesthetic education. It was desirable to have an interest in French and Italian art. Travellers typically came home with crates full of souvenirs that they had collected, such as paintings, sculptures and fine clothes. Canaletto, Vernet and Panini all painted for the 18th century tourist market. It was also fashionable to have your portrait painted, usually at the end of the Tour. Pompeo Batoni (1708-1787) painted over 175 portraits of travellers in Rome. Did women go on the Grand Tour? Although the Grand Tour was predominantly undertaken by gentlemen, a number of ladies also travelled abroad. The blue-stocking Hester Piozzi was particularly well-known for her travels in the 1770s and 1780s. Women who were separated or divorced from their husbands often travelled abroad as they were more readily accepted on the continent. 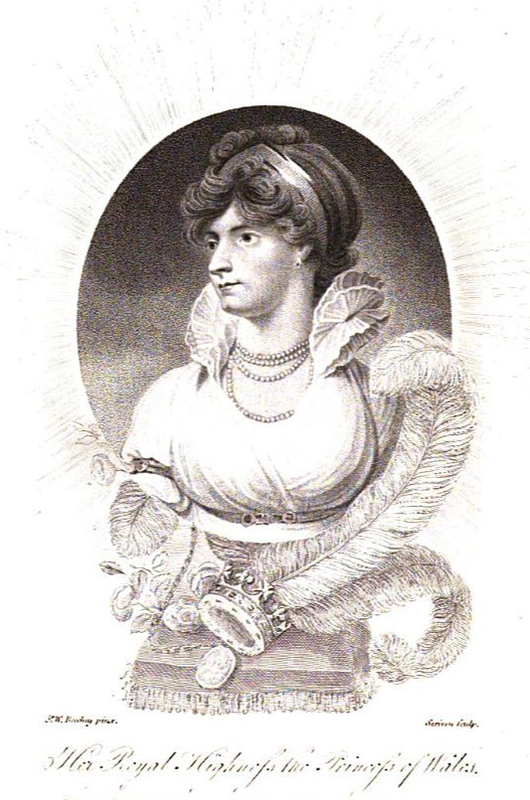 Georgiana, Duchess of Devonshire, went into exile abroad after becoming pregnant with her lover’s child in the early 1790s, whilst Caroline, Princess of Wales, travelled abroad from 1814 to 1820. 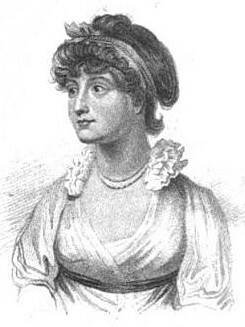 A group of women including Jane Parminter and her cousin Mary undertook the Grand Tour in the 1780s. When they returned in 1795, they built the sixteen-sided house, A la Ronde, in Exmouth to remind them of their travels and display their mementoes including several Bartolozzi prints and a shell picture. (1) From Devil's Cub by Georgette Heyer (1932), a Georgian romance. 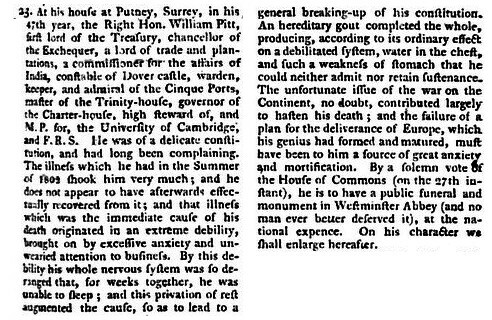 (2) From a journal entry dated 11 April 1776 in James Boswell’s Life of Samuel Johnson (1831), volume 3. 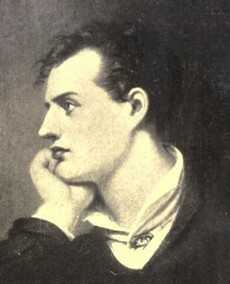 George Gordon Byron, 6th Baron Byron, was an English poet who was influential in the Romantic movement. His most famous works include Don Juan and Childe Harold’s Pilgrimage. 6. “The best friend I ever had in my life, and the cleverest of women.” “If she had been a few years younger, what a fool she would have made of me had she thought it worth her while.” Speaking of Lady Melbourne, 17 & 24 November 1813 in his journal. 13. “Fair Greece! Sad relic of departed worth! 20. “For what were all these country patriots born? This selection of 20 quotes from Lord Byron's poems, journals and letters was compiled to celebrate the anniversary of his death, 19 April 1824. 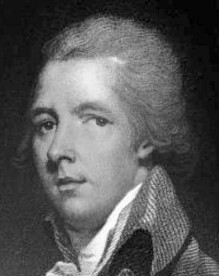 William Pitt the Younger died on 23 January 1806 at the age of 46. At the time of his death he was serving as First Lord of the Treasury and Chancellor of the Exchequer simultaneously! He was acting as Prime Minister, although there was no formal recognition of the post at this time (1). He had suffered from ill health for some years, and the strain of leading the government during a time of war proved too much for his constitution. 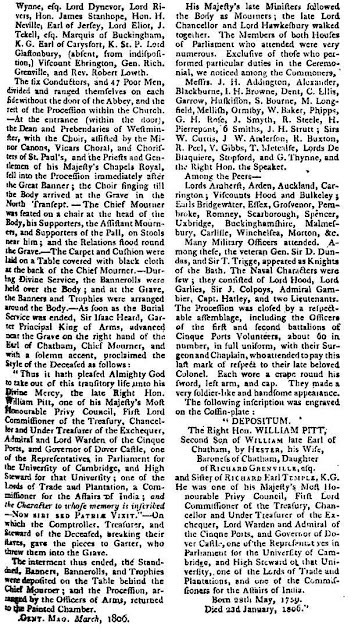 On Thursday 20 and Friday 21 February, Pitt’s body lay in state in the Painted Chamber in the Palace of Westminster and was visited by crowds of people. The public funeral was held on Saturday 22 February with the procession starting at 10am. 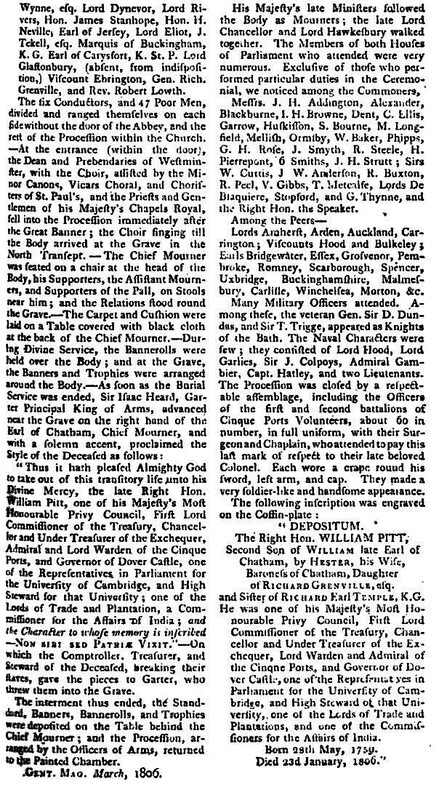 The Chief Mourner was Pitt’s brother, the Earl of Chatham. 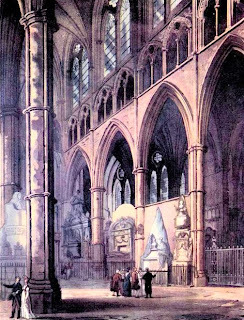 The funeral was held at Westminster Abbey and was attended by the Dukes of Cambridge, Cumberland and York and many members of both Houses of Parliament. (1) For more information on the evolution of the term 'Prime Minister', see the Number 10 website. Frances Villiers, Countess of Jersey (25 February 1753 - 25 July 1821), was an influential member of Georgian society and a mistress of George IV. 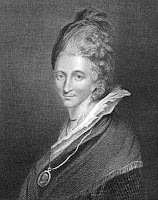 Frances Twysden was born on 25 February 1753 in Raphoe, Donegal, in Ireland, the posthumous daughter of Philip Twysden, the bankrupt Bishop of Raphoe, and his second wife, Frances. 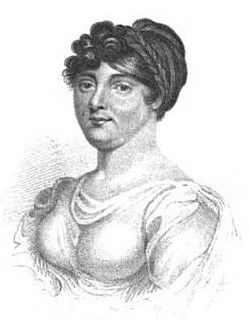 On 26 March 1770, Frances married George Bussy Villiers, the 4th Earl of Jersey, at the home of her step-father, General James Johnston, an aide-de-camp to George III. 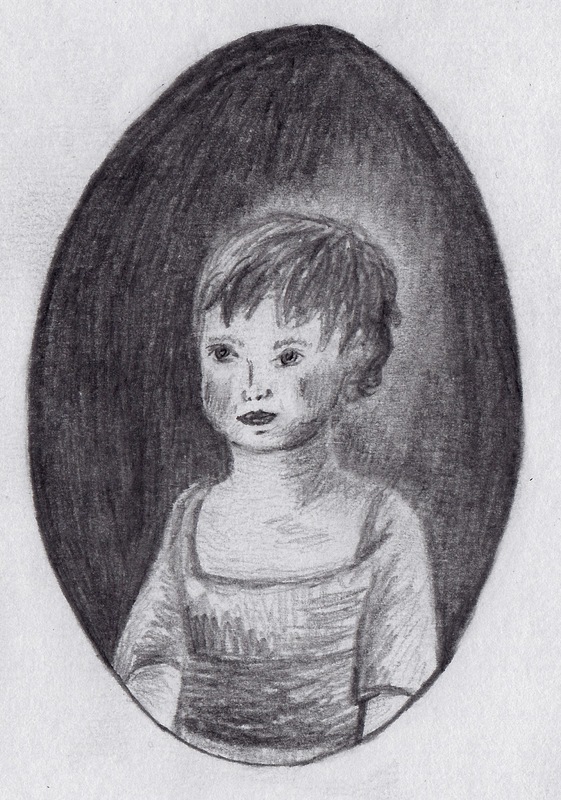 The Earl was almost twenty years her senior and was Gentleman of the Bedchamber to George III. He was known for his courtly manners, leading to the bluestocking Mrs Montagu dubbing him “the Prince of Maccaronies” (1). 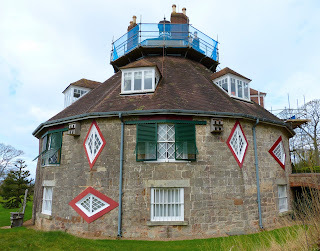 George and Frances had ten children, two sons and eight daughters: Charlotte (1771), Anna (1772), George (1773), Caroline (1774), Georgiana who died as an infant (1776), Sarah (1779), William (1780), Elizabeth (1782), Frances (1786) and Harriet (1788) (2). 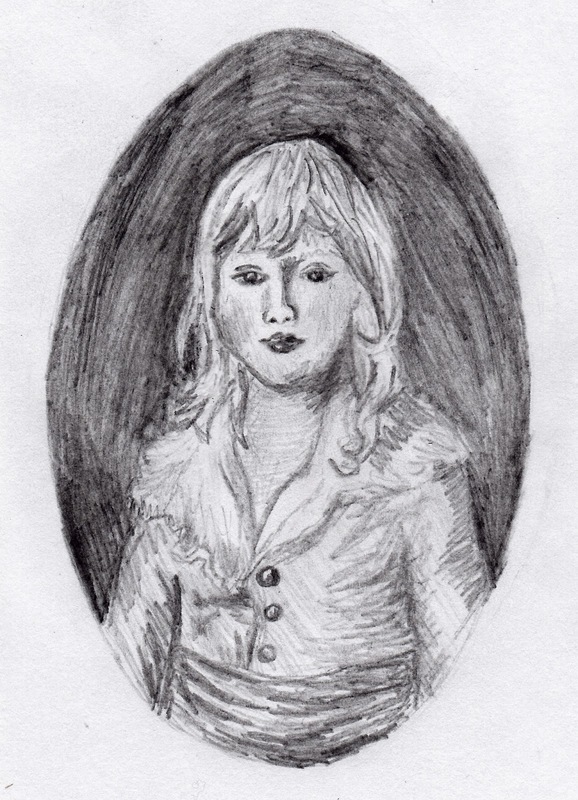 As Frances was by no means faithful, it is probable that some of her children were fathered by other men. However, she appears to have been genuinely attached to her husband who stood by her throughout their marriage. A great beauty, known for her charm, intelligence and wit, Frances was also a malicious gossip, notorious for her spiteful and vengeful nature. 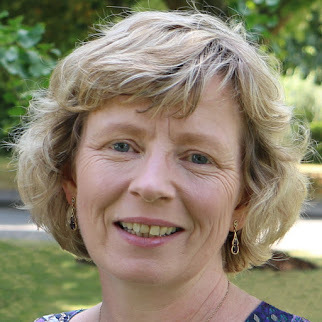 She was described in the Journal of Mary Frampton as “a clever, unprincipled, but beautiful and fascinating woman, though with scarcely any retrieving really good quality” (3). Lady Bessborough was equally condemnatory, once remarking that Lady Jersey could not be happy “without a rival to trouble and torment” (4). 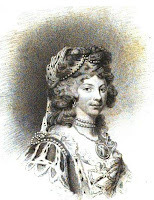 Georgiana, Duchess of Devonshire, referred to Lady Jersey as ‘Peste’ – the French for plague (5). 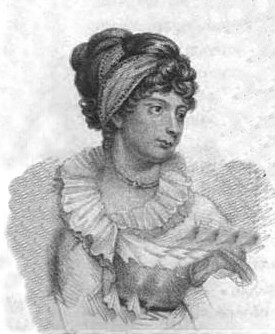 Georgiana Cavendish in the "picture hat"
Richard Brinsley Sheridan modelled his character Lady Sneerwell on a combination of her and Lady Melbourne in his play School for Scandal in 1777. Frances became friends with Georgiana, Duchess of Devonshire, and was part of the Devonshire House set that formed the hub of the Whig party. 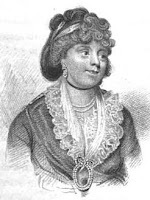 In the election of 1784, she campaigned alongside Georgiana and her sister Harriet in support of Charles James Fox, dressed in the Whig uniform of blue and buff with a foxtail in her hat. Frances was not faithful to her husband and engaged in a succession of affairs. 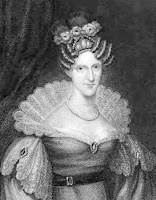 Her lovers included Frederick Howard, 5th Earl of Carlisle; Lord Morpeth; William Augustus Fawkener, clerk to the Privy Council; and William Cavendish, 5th Duke of Devonshire, husband of her ‘friend’ Georgiana, with whom she had a brief affair in 1778, which was terminated through the intervention of Georgiana’s family, the Spencers. But by far the most famous of Lady Jersey’s lovers was George, Prince of Wales. 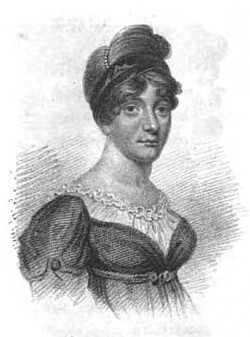 From as early as 1782, George was attracted to Frances, who was nine years older than him, but it was not until 1793 that she became his mistress, by which time she was forty years old and a grandmother. Having become George’s mistress, Frances was keen to establish her position. She encouraged the Prince to abandon Mrs Fitzherbert permanently and get married to solve his financial problems. She supported the choice of his cousin Caroline, believing that she would be no competition for her own attractions. In 1795, the besotted Prince appointed Lord Jersey as his Master of the Horse and made Frances Lady of the Bedchamber to his new bride. Frances lost no opportunity to taunt the Princess of Wales. She arrived late to meet her when she first arrived in England and then criticised her dress. She appeared openly as the Prince’s consort and drove about in a carriage accompanied by servants wearing the Prince’s livery. 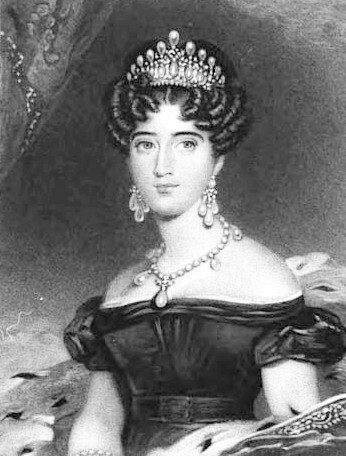 Princess Caroline hated Frances’ influence and begged to have her removed from her position by writing repeatedly to the Prince. 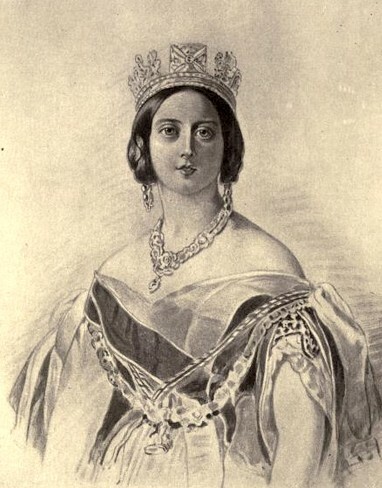 Frances was also accused of stealing Caroline’s letters and passing them to the Queen. Public opinion sided with the seemingly ill-treated Princess of Wales, and Lady Jersey and the Prince became increasingly unpopular. A mob stoned Frances’ London house and, when she visited Brighton, she was humiliated by a skimmington - two people masquerading as herself and the Prince, parading through the town on a donkey. Even amongst the ton she was shunned, most notably at a ball held by the Duchess of Gordon. Eventually, on 29 June 1796, Frances offered to resign from her post, claiming that she would have resigned earlier except that such an action seemed to prove her guilt. But it was not the end of the Prince’s affair with Frances. The Jerseys moved into a house in Warwick Street, adjacent to Carlton House, creating fresh scandal, and Lady Jersey spent Christmas with the Prince at Critchell House near Wimborne Minster. 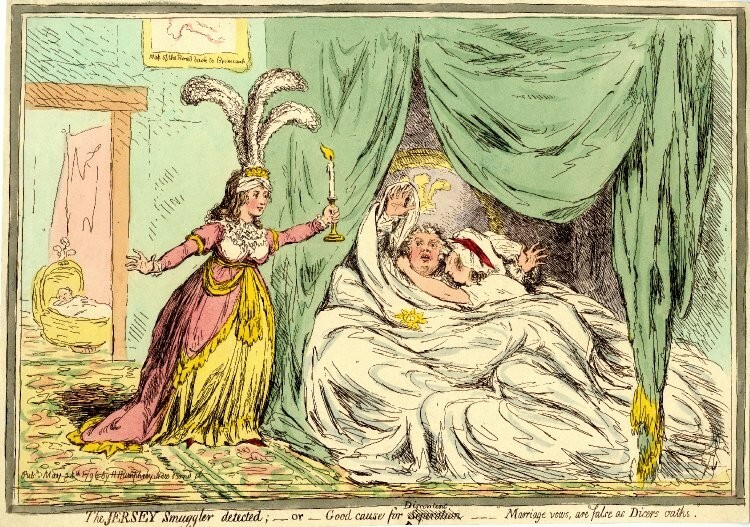 By 1798, the fickle Prince had tired of Lady Jersey. He sent his friends to negotiate an amicable parting, but Frances was reluctant to be put aside. 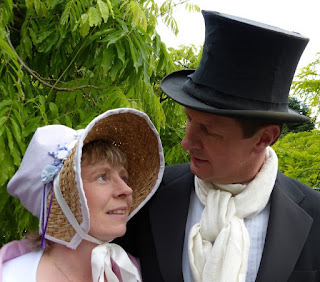 But by June 1799, the affair was over. 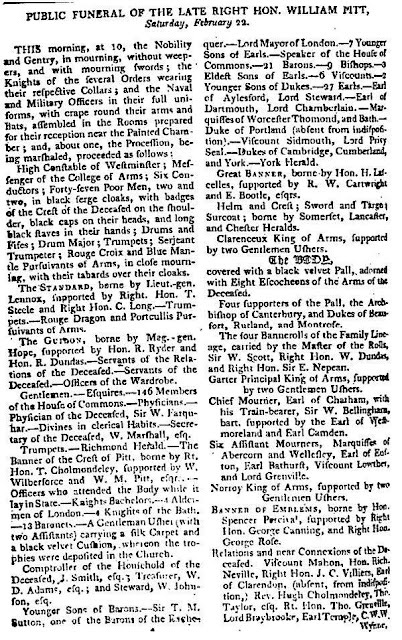 The Jerseys moved out of the house in Warwick Street and the Earl was dismissed from his role as Master of the Horse. All intimacy was at an end. Frances was furious and blamed Georgiana, who had been reconciled with the Prince, for turning him against her. 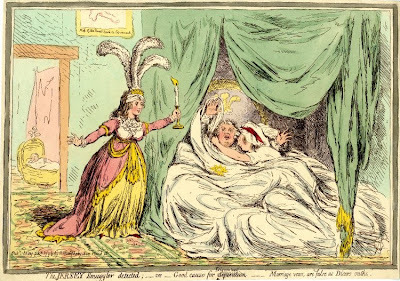 She determined to plague the Prince, and by all accounts succeeded, as in 1814, he railed against “all the wickedness, perseverance and trick of that infernal Jezabel Lady Jersey” (7). According to Aspinall, Lady Jersey “tried to pay off old scores by making mischief in the Orange marriage, but it does not seem that her influence on Princess Charlotte was considerable” (8). 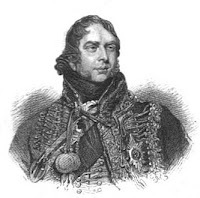 After her separation from the Prince, Frances was beset with financial difficulties, and in 1802, Lord Jersey was threatened with imprisonment over his debts. 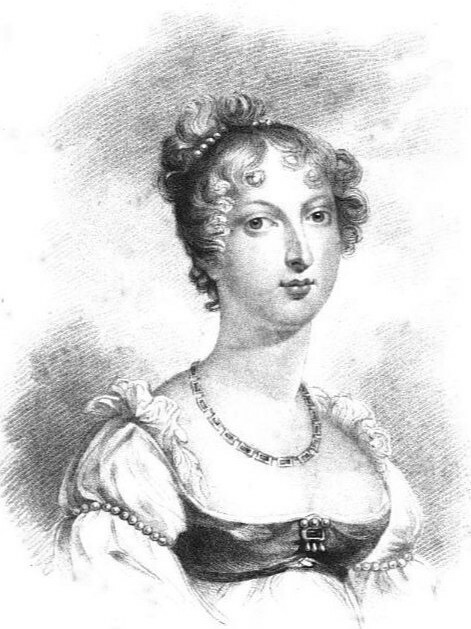 On 22 August 1805, the Earl died and Frances was left without sufficient means to support her in the life to which she was accustomed. She applied to the Prince for a pension which was eventually, reluctantly, granted (9). Her son George, the 5th Earl of Jersey, increased her jointure and paid her debts from time to time, but she had no notion of economy. Frances died on 25 July 1821 in Cheltenham and was buried in the family vault at Middleton Stoney. 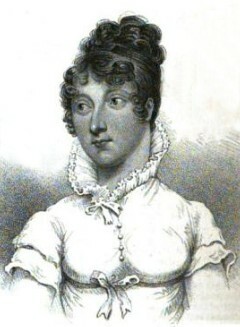 After her death, her executor, Lord Clarendon, burned many of her papers, including correspondence relating to George IV. 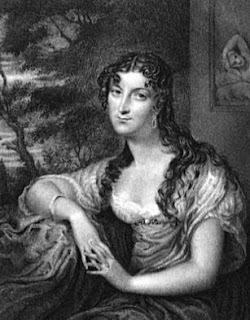 Frances is not to be confused with her daughter-in-law, Sarah, who was married to her elder son George Child Villiers, 5th Earl of Jersey, and was a leading member of the ton and a patroness of Almack’s. 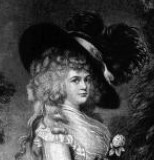 If you enjoyed this post, you might like to read about another woman in George IV's life, Maria Fitzherbert. (1) From George Bussy Villiers , fourth Earl of Jersey (1735-1805) Oxford Dictionary of National Biography by HE Maxwell (2004). (2) From Debrett's Complete Peerage (1838). (3) From The Journal of Mary Frampton (1885). 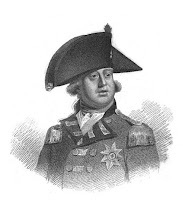 (4) From George IV by Christopher Hibbert (1972, 1973). (5) From Georgiana, Duchess of Devonshire by Amanda Foreman (1998). (6) From Georgiana, Duchess of Devonshire by Amanda Foreman (1998). 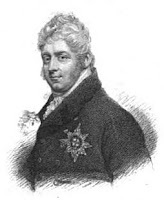 (7) From The Letters of King George IV edited by A Aspinall (1838). (8) From The Letters of King George IV edited by A Aspinall (1838). (9) From George IV by Christopher Hibbert (1972, 1973). 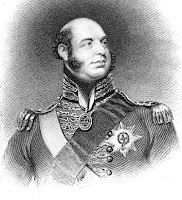 Prince Adolphus (24 February 1774 - 8 July 1850) was the seventh son of George III and Queen Charlotte. 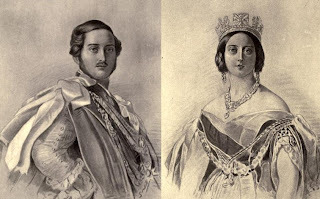 He was more economical than his brothers and was popular at court but did not get on well with his niece, Queen Victoria. 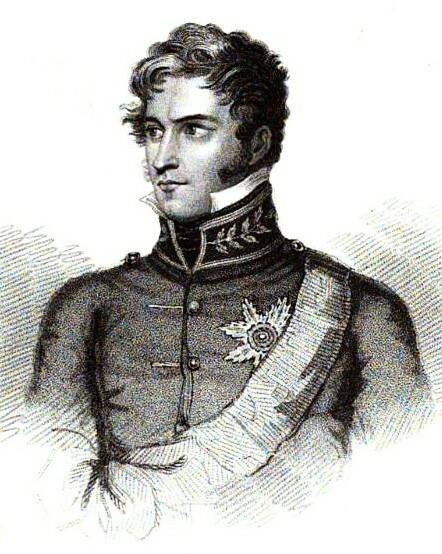 Prince Adolphus Frederick was born at Buckingham House on 24 February 1774. He spent his early years at Kew, sharing a house with his older brothers, Ernest and Augustus. 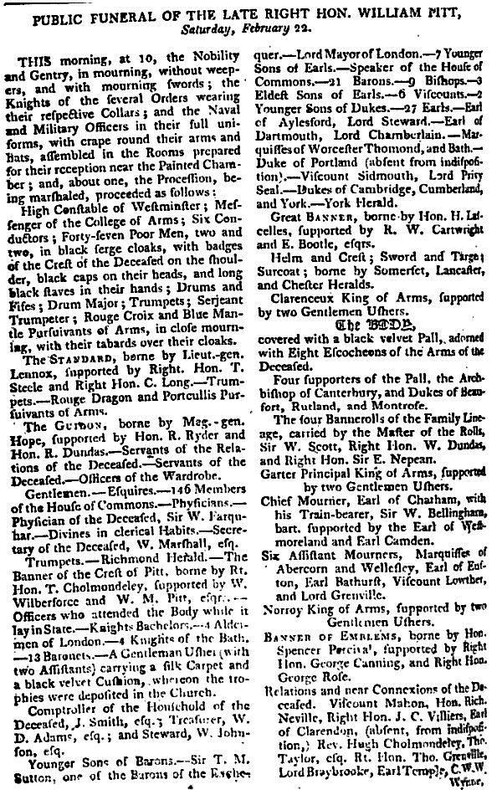 On 2 June 1786 (1), he was made a Knight of the Garter and, shortly after, went with Ernest and Augustus to the University of Göttingen. Here his studies included the classics and theology, and he learned to fence. In 1790, Adolphus travelled to Berlin to study military tactics before becoming a Colonel in the Hanoverian army. He fought in Flanders in 1793, where he was wounded and captured temporarily by the French. After recuperating in England, he returned to the Hanoverian army where he served again in Flanders. 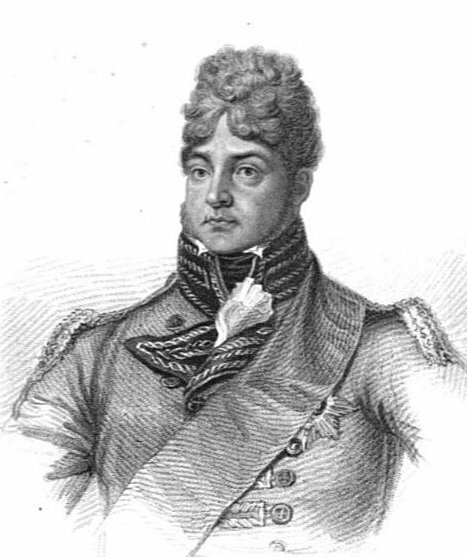 He retreated back to Hanover with the Hanoverians, but when they refused to stand up to Napoleon in 1803, Adolphus was forced to return to England. Back in England, Adolphus was made Military Commander of the Home District and Colonel in Chief of the Coldstream Guards, but these were empty titles and he saw no active service. 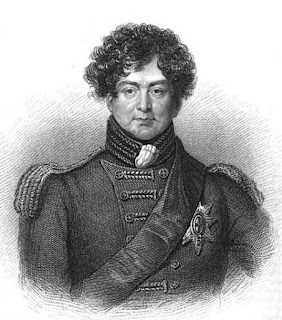 On 26 November 1813, he was promoted to Field Marshal in the British army. In 1813, Adolphus returned to Hanover where he served as Governor General. He was made Viceroy in 1831 which gave him the power to introduce a more liberal constitution in Hanover. 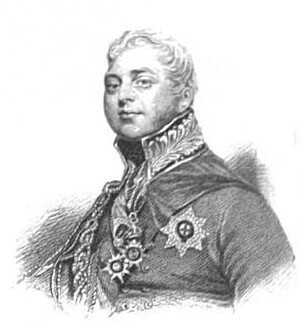 On the death of William IV in 1837, his brother, the Duke of Cumberland, acceded to the Hanoverian crown and, once more, Adolphus was forced to return to England. 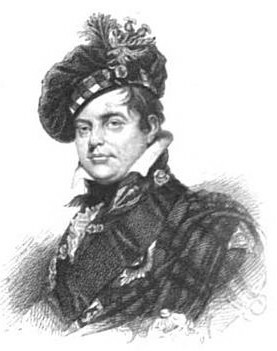 On 27 November 1801 (2), Adolphus was made Duke of Cambridge, Earl of Tipperary and Baron of Culloden. 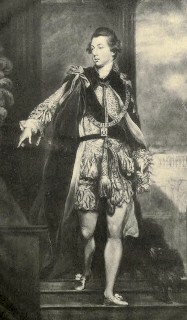 Adolphus was popular at court and with the public and was the only one of George III’s sons who successfully lived within his means and had a personal life that was free from scandal. He was very fond of music and skilled at playing the violin. In later years, he was apt to join in impromptu at musical parties, either singing or on his violin. He became very deaf and was notorious for speaking out loudly during church services. Adolphus was sympathetic towards the Jews and was criticised in the press for his religious tolerance after he went to the Great Synagogue in Duke’s Place in 1809 to see a Jewish service with his brothers the Duke of Cumberland and the Duke of Sussex. 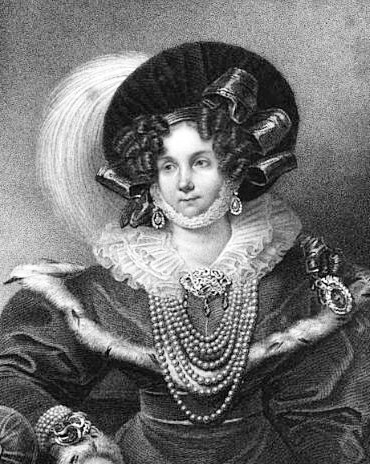 In 1797, Adolphus was unofficially engaged to his cousin Princess Frederica of Mecklenburg-Strelitz, the widow of Prince Louis of Prussia, but George III did not want them to marry until the war was over. In the meantime, Frederica became pregnant by Prince Frederick of Solms-Braunfels whom she subsequently married. 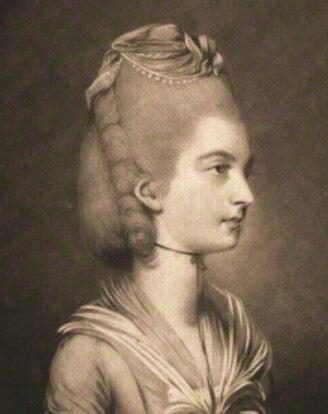 After she had been widowed a second time, she married the Duke of Cumberland. 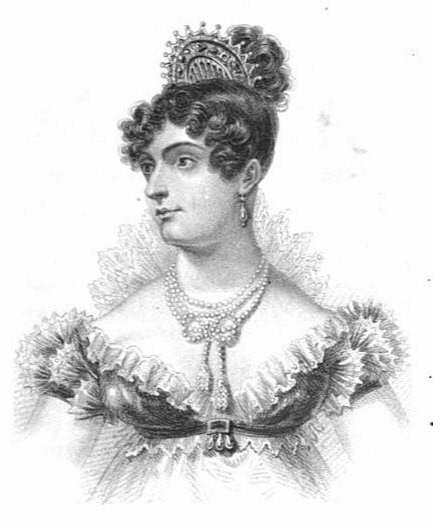 On 7 May 1818, Adolphus married Princess Augusta Wilhelmina Louisa of Hesse-Cassel in Cassel. The ceremony was repeated at Buckingham House on 1 June. 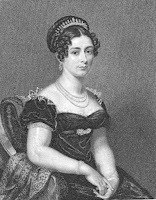 Adolphus and Augusta had three children: George William Frederick Charles (1819), Augusta Caroline (1822) and Mary Adelaide (1833). Queen Victoria did not get on well with her uncle Adolphus or his wife. 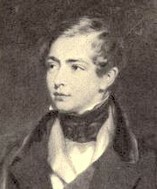 Adolphus’ son, George, spent much of his childhood at Windsor in the hopes that he would marry his cousin, but the match did not take place as neither Victoria nor George desired it. Moreover, Victoria seems to have been offended that it should ever have been suggested. In addition, there was the matter of precedence. The Duke of Cambridge allowed Victoria’s husband, Prince Albert, to take precedence over him. But instead of receiving this graciously, the Queen assumed this as a matter of course, offending the Duke and Duchess. 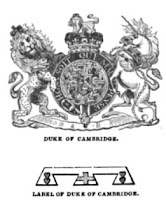 The Duchess retaliated by sitting during a toast to Prince Albert at a party; the Queen insulted the Cambridges by excluding them from a ball at Buckingham Palace. When Prince Albert failed to appear at a banquet to celebrate being given the freedom of the city of London, the Duke of Cambridge gave a rather coarse speech which was reported in the press, much to the Queen’s horror and embarrassment. Fortunately, their relationship improved over time. (2) From Debrett's Complete Peerage (1838); Adolphus Frederick, Oxford Dictionary of National Biography by Alan Palmer (2004) states 24 November 1801 and Wikipedia states 17 November 1801. (5) From College of St George's Chapel, Windsor, website.